Fig. 1. — The Wonderful Tesla, 300 K.W. High-Frequency Oscillator Coil in Full Activity, Discharging Sparks Like Veritable Bolts of Thor and Measuring 65 Feet Across. One of the most perplexing problems that scientists have attacked during reccnt years involved either the harnessing or imitation of the forces of Nature. Many of our greatest scientists in all parts of the globe have spent fabulous sums and years of patient study on such problems, but most of them have signally failed; a number of eminent scientists even claim that such conundrums will never be thoroughly solved. This, however, appears, in our present day, to be highly doubtful. As early as 1890 Dr. Nikola Tesla undertook to solve the problem, and some years later succeeded in demonstrating to the world that it is quite possible to imitate certain natural dynamic forces on a scale of surprisingly vast magnitude. Fig. 2. 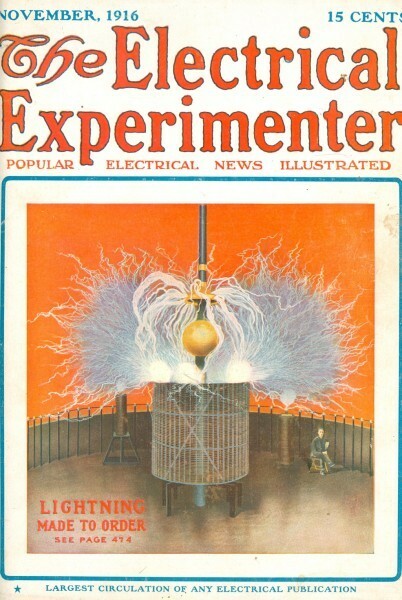 — A Close View of the Tesla Coil and a Massive Metal Ball Which Acts as a Reservoir for the Electric Charges. Most of us know that Lightning is a natural electrical discharge taking place between two adjacent clouds, each having been charged with electricity of opposite polarity. As soon as they approach sufficiently close, the electric potential between them becomes so terrific that the air strata between is ruptured, thus producing a vivid spark, followed by thunder, which is caused by the sudden rush of air into the evacuated space produced by the electric discharge. Lightning may be caused also by a discharge taking place between a cloud and the earth. The process by which the clouds are electrically charged is still a mystery, and we must wait until some future genius will explain to us the exact phenomena that takes place in the upper atmosphere, where such electrical disturbances take place. Dr. Nikola Tesla, who is perhaps the greatest living authority on alternating currents of both high and low frequency, has performed some of the most marvelous experiments ever dreamed of with high potential, high frequency currents. 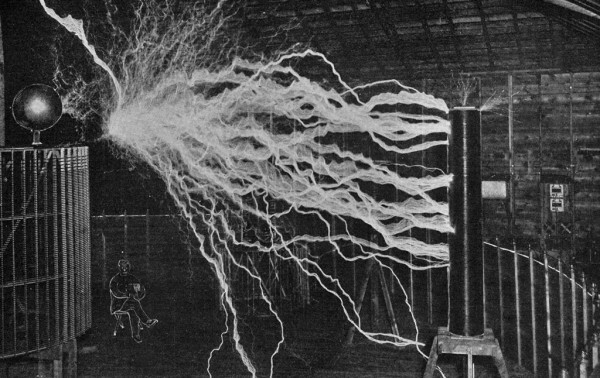 As early as 1890 this savant had produced electrical disturbances in his laboratory at Colorado Springs equal to the lightning produced by Nature. 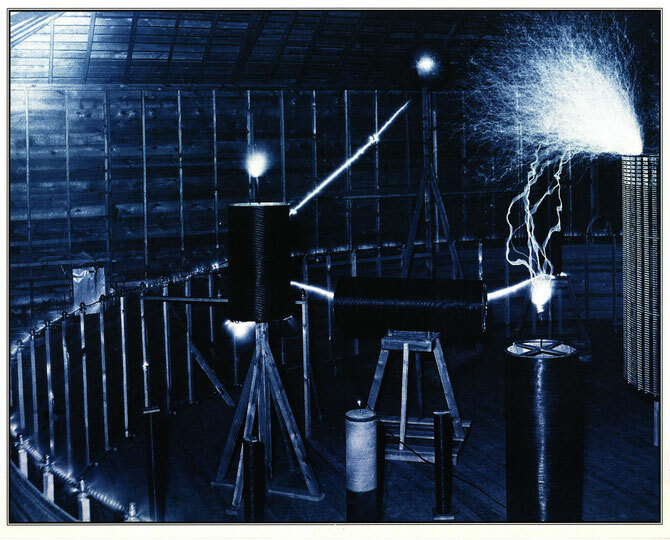 Although a number of years have elapsed since these experiments were conducted, not a single scientist or engineer has been able to produce such awe-inspiring, electrical performances as did Dr. Tesla. It is true that he is far ahead of his time in many of his inventions, yet he has ably demonstrated that it is possible to imitate some of Nature’s secret forces. It should be noted that his sole purpose was not simply to imitate these forces, but he was performing certain experiments on the problem of radio transmission of electrical energy through space. 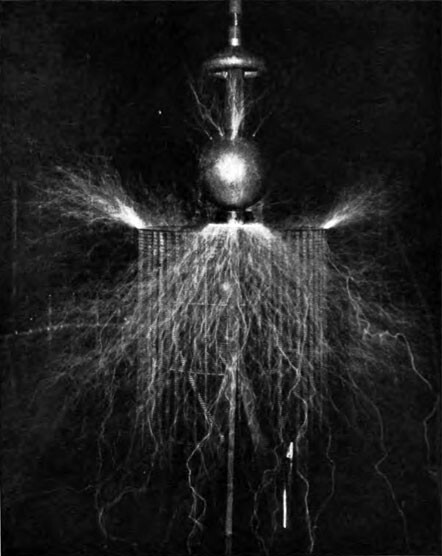 The startling lightning effects here shown were produced during the course of these experiments. During a recent interview the writer had with Dr. Tesla, the photographs herewith reproduced were kindly loaned to accompany this article. Two of these photos were never shown to the public before. Our front cover, painted by Mr. George Wall, is an exact reproduction in colors corresponding to Fig. 1. The man was seated near the apparatus solely for the purpose of showing the relative size of the high frequency oscillation coil. The photograph was obtained by double exposure; that is, the plate was exposed with the man, while the apparatus was not in operation; then he was removed and another exposure made of the sparks on the same plate, as it would not be very healthy for anyone to be there when the experiment is conducted. Fig. 4. — A Problem in Harmonics. 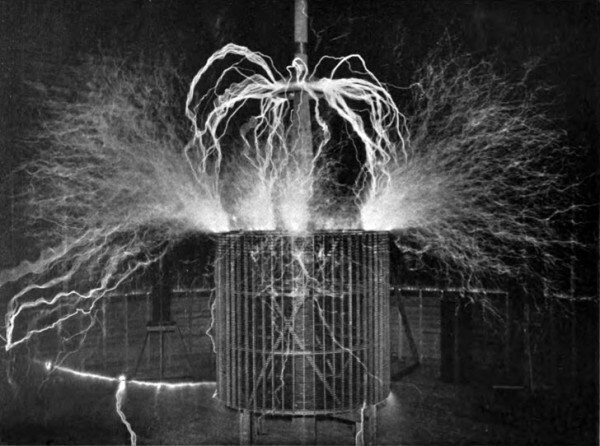 Dr. Tesla Placed a Number of Inductance (Air Core) Coils Within the Large High Frequency Coil as Shown. Each Coil Resonated or Became Attuned to a Certain Harmonic of the Fundamental Oscillation. Glowing as Seen. In Fig. 1 we see the Tesla electric oscillator in full activity at twelve million volts and a frequency of one hundred thousand per second! The flame-like discharge measures sixty-five feet across. This experiment was performed for the purpose of showing how the nitrogen of the atmosphere could be made to combine with the oxygen. The large wire cage measured 20 feet in diameter and 30 feet in height. This is not the actual coil which is excited by the primary of the Tesla transformer, but a separate helix which is attuned to a certain frequency of the secondary of the transformer. This is apparent by noting the large circular fence-like wall in the rear, which measures 60 feet in diameter and which is wound full with heavy copper wire. The primary is carefully imbedded in the ground and connected with the regular oscillating circuit, comprising high tension oil condensers and the inductance incorporated in the primary of the Tesla transformer, also a spark discharger. In all these experiments the primary of the low tension transformer was excited with 300 kilowatts of electrical energy. A very striking experiment showing the emission of an electrical discharge from a large sphere is shown in Fig. 2. The ball has a surface of twenty square feet which represents a large reservoir of electricity. The inverted circular pan underneath with sharp rim has an opening thru which the electricity can escape before filling the reservoir. The quantity of electricity liberated is so enormous that, although most of it escapes thru the rim of the pan or opening provided, the ball of the reservoir is nevertheless alternately emptied and filled to overflowing, as is evident from the discharge escaping on the top of the ball. The coil shown in Fig. 3 creates an alternative movement of electricity from the earth into a large reservoir and back, at the rate of one hundred thousand pulsations per second. The adjustments were such that the reservoir fills and bursts at each alternation just at the moment when the electrical pressure reaches the maximum. The discharge escapes with a deafening noise, striking an unconnected coil twenty-two feet away, and creating such a disturbance of electricity in the earth, that heavy sparks an inch long were drawn from the water main at a distance of three hundred feet from the laboratory. One very interesting experiment conducted by Dr. Tesla showed how it is possible to tune several coils to different frequencies with respect to the fundamental frequency generated by the main exciting coil. A photograph showing this experiment is reproduced at Fig. 4. The large coil on the right, discharging strongly, is tuned to the fundamental vibration which is fifty thousand cycles per second; the two larger vertical coils to twice that number; the smaller coils, wound with white wire, to four times that number and the remaining small coils to higher harmonics. The vibrations produced by the oscillator were so intense that they affected perceptibly a small coil tuned to the twenty-sixth harmonic above the fundamental. The scientific world is keeping its eyes peeled for the next epochal movement in the problem of transmitting energy via wireless. And the world expects Dr. Nikola Tesla to do this.